Want to talk with our experts? Architects and builders have trusted Ortal fireplaces for over three decades. That’s because we manufacture modern gas fireplaces that meet modern needs—fireplaces known throughout the world for their beauty, efficiency, and safety. Keep reading to learn more about the advantages of an Ortal fireplace. When a client looks at a fireplace, the first thing considered is its aesthetic appeal. How does it look? Does it complement the design of the home? Does it reflect the client’s own sense of style? For architects and builders, it’s a matter of finding the perfect fit—that one fireplace which will enhance the unique charm of a particular space. Since they deal with nearly every architectural and interior design style, from traditional log homes in the remote mountains to ultra-modern Scandi lofts in the heart of the city, they need a large selection from which to choose. That’s why Ortal offers over 80 standard models with over 30 different interior media options and a variety of sizes. Characterized by clean, frameless design and exquisite proportions, our modern fireplaces are renowned for their sense of beauty. Even our traditional fireplaces, with their classic mantels and hearths, feature a modern emphasis on crisp lines and refined beauty. Ortal has always led the way when it comes to innovative fireplace design. We were one of the first fireplace manufacturers to equip our multi-sided fireplaces with glass-on-glass corners instead of metal corners that interrupted the design and blocked the view of the flame. Our desire for perfection extends to our interior media solutions. Not only do we offer dozens of materials, from Aspen Logs to Royal Cobalt Glass, these media options can be mixed together for limitless design options. To this day, we continue to revolutionize fireplace design. Now you can add recessed lighting for greater depth and nuance, or pick from a variety of beautiful facing materials. In other words, we give you more choices, so you have greater creative control over your next project. These days, homeowners are as concerned about efficiency and ease as they are about beauty. They no longer tolerate the soot, smoke, ash, pollution, and exorbitant gas bills of older, less efficient fireplace options. They want fireplaces that are clean, easy to use, eco-friendly, and energy efficient. Not only do Ortal fireplaces rely on direct-vent technology, which prevents heat loss by sealing the firebox off from the room, but our unique burner design also ensures the cleanest possible use of gas, combining optimal warmth and heating savings. In fact, Ortal fireplaces are some of the most energy-efficient models in the industry. Check out our CSA Energy Efficiency Listing to learn more! Architectural projects require communication, collaboration, and information. That’s why Ortal works closely with fireplace installers and dealers across the country and provides architects and builders with start-to-finish project support. That includes full specs, installation manuals, how-to videos, customer support, and more. 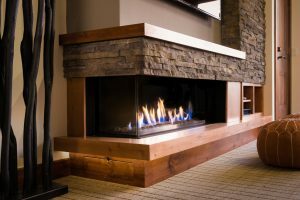 Contact us to find your local fireplace installers and Ortal dealers to install a beautiful, modern, and efficient fireplace in your next space!